We watched a lot of Sesame Street, but my old brain doesn't remember either one of those clips. I can't help but wonder who would let those two little kids play with a dollhouse full of teeny tiny pieces like that. I mean those are total choking hazards or at the very least would get ground into and lost in the carpet......oh god, I just became my mother. The doll house one brought back sweet memories of watching Sesame Street with my girls. It is such a lovely little scene. OMG - I remember the milk one! The doll house one not so well - but it seems vaguely familiar. OMG I totally remember the milk video.....what a flashback. I love this blog! I totally remember those! My favorite was the crayon factory. I feel so old watching these. I think my favorite was the cookie machine one. 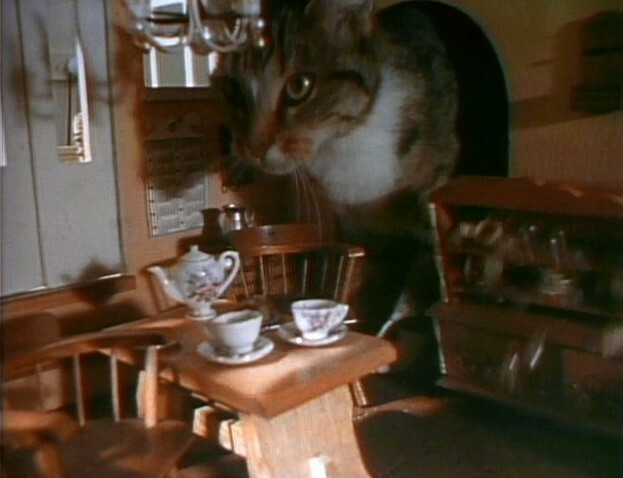 I can totally see my two cats breaking into the dollhouse, they would have such fun!! 1970's Sesame Street, I grew up watching that, and still have a major crush on Maria (Sonia Manzano). I often especially became more fond of her when she appeared in those fast motion, slow motion pixilated short films. Such as when Maria attempts to build a matching tower out of large colorful blocks, or when she's Speedy Maria, when she demonstrated subtraction by taking away chairs from the scene. You tell me on how back then a parent in NYC would let their kids go outside and play and go who knows where, and then they won't come home until sundown. I loved the night time closing credits song as it sounded like a lullabye, and the dream sequences of Bert Ice skating, and when they sing a song about imagination, and in the end you see tons of colorful balloons falling in Sesame Street at night.